The Vancouver Olympic torch. That was such a fun two weeks. Okay, I admit it. That title’s a bit of a lie. You can’t become good at sports just by thinking about it. But you can give yourself a leg up, pun totally intended. Training your muscles is critical, but there’s no question that thinking in the right way can increase your chances of doing well in sports. I’m not talking about dreaming, or wanting, or never giving up, or all that other stuff that Olympic sportscasters talk about. Drive and desire are important. They’re as critical to sports as to, say, getting your Ph.D. in Neuroscience. But drive isn’t what this post is about. This post is about a very specific way of training your brain, so that your brain is better at training your muscles. 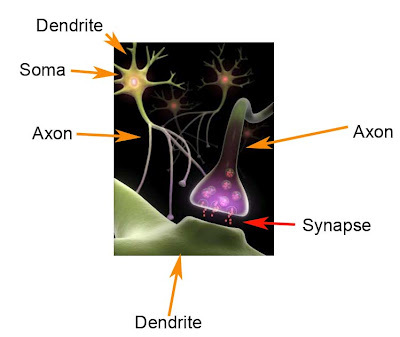 In this blog, I’ve talked a lot about neurons, which are the cells that make up your brain. Neurons connect to each other at points called synapses. When neurons are active (we call this “firing”), they release chemicals at the synapse. This is how neurons talk to each other. When you learn, you’re causing certain neurons to fire over and over again. This repeated firing causes your synapses to change. They become more sensitive to neurotransmitters. They become stronger. These changes last from days to years. This process underlies learning and memory. From a cellular neuroscience perspective, learning and memory are the same thing. 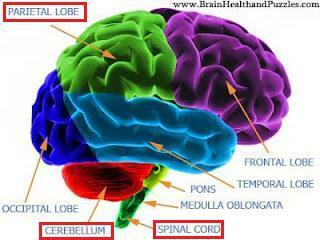 The parietal lobe, cerebellum, and spinal cord. Let’s pretend that I want to get to my kitchen, because I’m hungry. First, an area in my brain called the parietal lobe brain comes up with a lot of possible plans. I could get to my kitchen by skipping, sprinting, uncoordinated somersaulting, or walking. The parietal lobe sends these plans to another brain area called the basal ganglia. The basal ganglia picks “walking” as the best plan (though uncoordinated somersaulting was a close second). It tells the parietal lobe the plan. The parietal lobe confirms it, and sends the "walk-to-kitchen" plan down the spinal cord and to the muscles. The muscles move. As they move, my cerebellum kicks into high gear, making sure I turn right just before I crash into my kitchen counter, and that I jump over my dog (he loves to get in my way and beg for cuddles). Part of the cerebellum’s job is to make quick changes to muscle movements while they’re happening. The basal ganglia are blue. 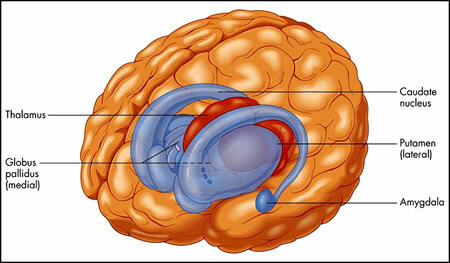 The caudate, putamen, and globus pallidus are all part of the basal ganglia. The amygdala is not - its job is emotions, not muscle movement. In real life, the basal ganglia are located deep inside the brain. You can't see them from the surface. This involves a lot of neurons, and a whole lot of synapses. Millions of synapses would be a low estimate. Since synapses are where learning happens, that’s millions of chances to learn. How do you think your way to success at sports? You visualize. Over and over and over again. Picture those movements. See yourself catching that ball. Dancing that toe-touch. Swimming that breaststroke. Watch it in the movie of your mind whenever you can. Scrutinize it. Is your wrist turning properly? Is your kick high enough? If not, change the picture. See yourself doing the movement perfectly. As far as your parietal lobe and basal ganglia are concerned, this is exactly the same as doing the movement. By visualizing the movement, you activate all those planning pathways. Those neurons fire, over and over again. Which is what needs to happen for your synapses to strengthen. In other words, by picturing the movements, you’re actually learning them. This makes it easier for the parietal lobe to send the right message to the muscles. So when you actually try to perform a movement, you’ll get better, faster. You’ll need less physical practice to be good at sports. This doesn’t work for general fitness. You still need to train your muscles and heart and lungs to become strong. But it’s very good for skilled movements. Basketball lay-ups. Gymnastics routines. Six months ago I earned a black belt in taekwondo. I’m certain that one of the reasons I passed the technical portion of the test is that I visualized my forms, kicks, and self-defenses over and over and over again, whenever I could. (The physical test was another matter – the only way I was going to get my body to do 150 push-ups in 5 minutes was to do a gazillion training push-ups, and I HATE push-ups.) But for techniques, visualization worked like charm. I trained my brain, and that made it easier to train my muscles. This doesn’t only work for sports. Music, for example, also requires skilled muscle movements. So if you find yourself sitting around with nothing to do, or bored in the shower, or lying in bed trying to fall asleep, turn on your mind-movie, and picture yourself doing your sport. Keep it up, and I’ll bet you improve. Two more years until the next Olympics action! This picture was taken at Vancouver 2010, so the countdown's a wee bit off now.